This tool supports ZLAS and LAS file versions 1.0 to 1.4. 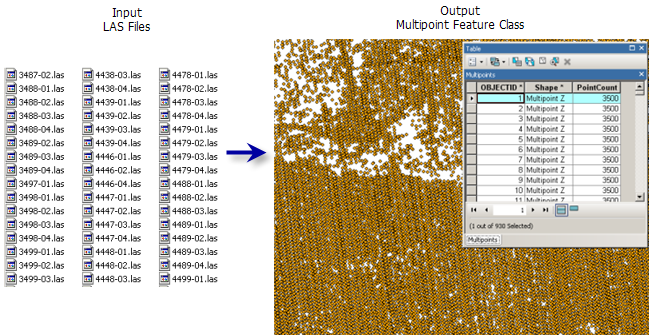 The LAS format supports the storage of numerous predefined attributes for each lidar point. If you do not know which attributes are available with a given collection of LAS files, consider using a LAS dataset to review the LAS file properties. When loading multiple LAS attributes into an Oracle database, you'll need to make sure all DBTUNE keywords for parameter attribute_binary are set to use binary large objects (BLOBs), not LONGRAW. This is because LAS attributes are loaded as BLOBs, and Oracle does not support multiple BLOBs in LONGRAW tables. See your Oracle database administrator for assistance. The LAS or ZLAS files that will be imported to a multipoint feature class. If a folder is specified, all the LAS files that reside therein will be imported. The average 2D distance between points in the input file or files. This can be an approximation. If areas have been sampled at different densities, specify the smaller spacing. The value needs to be provided in the projection units of the output coordinate system. The classification codes to use as a query filter for LAS data points. Valid values range from 1 to 32. No filter is applied by default. The return values that will be used to filter the LAS points that get imported to multipoint features. The coordinate system of the input LAS file. The suffix of the files to import from an input folder. This parameter is required when a folder is specified as input. NO_RECURSION —Only LAS files found in an input folder will be converted to multipoint features. This is the default. RECURSION —All LAS files residing in the subdirectories of an input folder will be converted to multipoint features.